RLD’s very own Pamper Manager Sevda, recently took a trip to Worcestershire to The Malvern Spa to find out first-hand how relaxing this purpose-built spa and hotel is! Find out how she got on and what she made of her visit to the luxury spa. The Malvern Spa and Hotel is located in the historic spa town of Malvern and has been home to the town’s first spa since 1910. Designed with grown-ups in mind, it is the perfect spot to escape the stresses and strains of modern life. It is clear from the details of this spa that it was not an after-thought or late addition to the hotel, as all of the facilities are perfectly coordinated – no long walks to get to the sauna or scrabble for a sun lounger here! Sevda quickly discovered the wonderful hydro pool which rightly stars as the focal point of the spa facilities. Filled with Malvern spring water and heated to 35º, the pool extends both inside and out and is perfect to relax in, with the Jacuzzi jets performing different sequences in each section. If you get lucky with the weather, you could stay in there all day long! Kelo Sauna: The first of its kind in the UK, this unique rustic sauna is constructed from naturally fragrant wood found only in the Arctic Circle. The kelo sauna is a large social space with plenty of room to recline, chat or simply soak up the aromatic atmosphere. Crystal Steam Room: This large, fully-tiled steam chamber is infused with essential oils that fill the intensely warm and humid air with relaxing aromas. The crystal steam room is a fantastic way to open pores and relieve tension in the body, expect to step out of it feeling calm and refreshed. Salt Grotto: The salt grotto possesses healing properties and works by gently warming the body on the heated tiled seats, whilst you are are enveloped in salt steam. This rich, natural source of salt microns and negative ions are said to have a restorative effect on the respiratory system, skin and ionic balance of the body, resulting in a complete feeling of well-being. Herb Sauna: For a more contemporary sauna, seasonal herbs and natural essential oils are gently steamed to cleanse body and mind in the herb sauna. This state-of-the-art sauna radiates a soft heat with a higher humidity than the harsh dry heat found in a standard sauna, so you can relax for longer. Ice Fountain: This treatment involves scooping handfuls of crushed ice from a large central fountain and rubbing them vigorously onto the skin to stimulate circulation and close the pores. Bucket (drench) Shower: For the more adventurous, a quick way to cool down is to use the cold bucket shower which instantly drenches you in chilled water for an exhilarating end to your fire and ice experience. Sevda particularly enjoyed the Kelo sauna, it had real wood log-lined walls and felt very authentic. For a moment she imagined being transported into a cosy wood cabin in the Alps somewhere! The icing on the cake for Sevda was the spa’s relaxation room. Often such rooms are far from relaxing and can be found in noisy areas. The Malvern’s was tucked away in the furthest corner of the spa, away from all the wet and thermal facilities. Blacked out, with very dim lighting, a water feature in the centre of the room and water stream as gentle background sound, it seemed the perfect place to totally give in to relaxation. The relaxing loungers came complete with a blanket and it was the first relaxation room Sevda had ever been able to fall asleep in! Sevda also checked out the hotel restaurant and enjoyed lunch there before leaving. 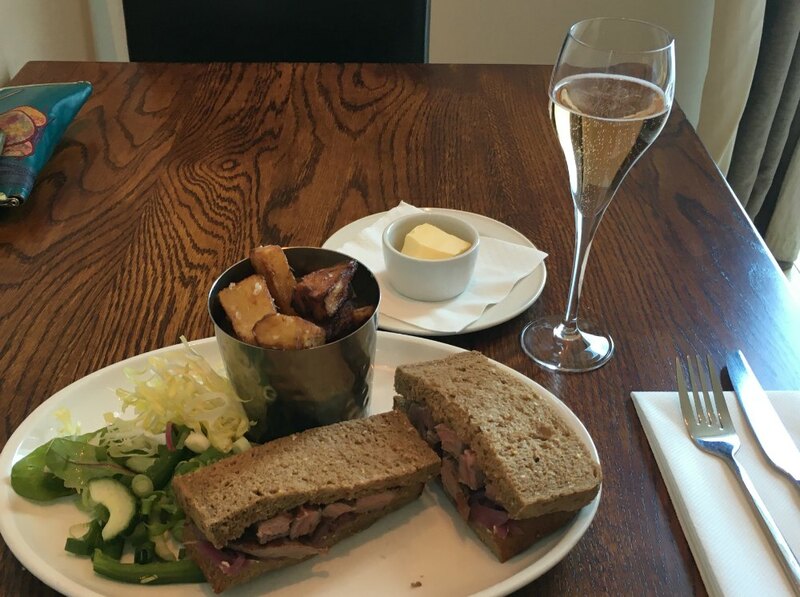 She tucked into a steak sandwich with caramelised onion, hand-cut chunky chips and a glass of Prosecco. Sevda found her experience at the restaurant even more enjoyable, as the restaurant manager was warm and charming (he even sang a little song whilst taking orders on a nearby table). So unwind and become a radical relaxer for the day at a pampering spa stay of your choice. The Malvern Spa gets a big thumbs up from Sevda! She found that everything there was designed to boost relaxation and left her walking on air! Have you been to The Malvern Spa? Let us know what you thought of your visit! Where else has Sevda toured?